Left to right: Tasha Lawrence, Jessica Lynn Carol, Richard Prioleau. Photo courtesy Kevin Berne. Though there are many political thrillers in the world of theatre, not many describe the surreal experiences of journalists on the campaign trail. Suzanne Bradbeer’s Confederates, premiering at TheatreWorks in Palo Alto, uses this setting to examine the nature of scandal, journalism’s role in modern politics, and whether it’s more important to be first or to be right. Three characters are present in the play: Maddie (Jessica Lynn Carroll), the daughter of a long-shot Presidential candidate, and the two journalists covering her and her family. Will (Richard Prioleau) has a personal connection with Maddie, and Stephanie (Tasha Lawrence) has a Type-A personality and a burning desire to get the scoop. Caroll portrays Maddie as likeable with an ignorant streak, perhaps similar to the main character of Unbreakable Kimmy Schmidt. 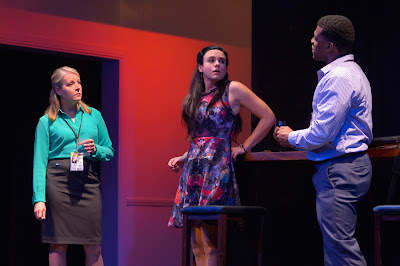 While the play centers on Maddie’s major gaffe, the audience can safely believe that what she did was not out of malice. Maddie despises Stephanie and only talks to Will, who then talks to Stephanie. This makes Will the only connection between his fellow journalist and the woman they are both writing about. As Will, Prioleau interprets his stage time with each of the other actors differently: He’s collected and mature around the childish Maddie, but a little goofier and able to deliver jokes to Stephanie when she’s around to act as a foil. Lawrence is great at becoming the archetypical career woman as Stephanie, but adds a third dimension to the character through her love of the political game and her adoration of the intelligent, erudite candidate she’s covering. Andrew Boyce’s set, modern with lots of glass and bold colors like the set of a cable news show, is, without doubt, one of the best TheatreWorks sets I’ve seen. It serves the needs of the production’s numerous locations, including buses and hotel rooms, while tying everything together in something slick and modern. This evokes the political themes of the play without beating the audience over the head with symbolism. With instant access to a flood of news from large, faceless websites, it’s easy to forget the process that goes into delivering it. Confederates at Theatreworks takes a fascinating look into this life, portraying journalists not as marionettes holding cameras, but as real people who sometimes let their feelings get in the way. If you enjoy plays about politics, but want a fresh perspective on the climb to the top, Confederates is worth a watch.